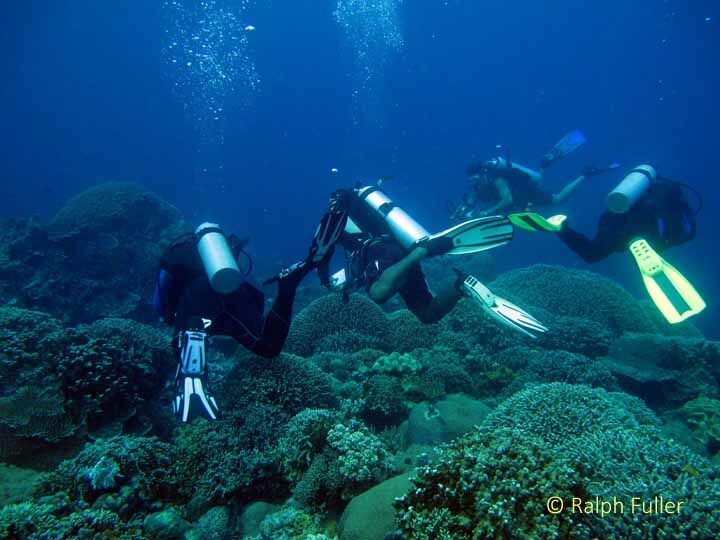 Any discussion about diving Negros should start with a shot of the wonderfully preserved reefs at Apo Island. At top, soft coral. MY POST IN THE ORIGINS SECTION, “The Far Side of the World: Geohistory & the Triangle of Diversity,” helps explain why we in the U.S. pay much more money and travel much longer distances to dive in the Pacific rather than the Atlantic/ Caribbean. At one time ocean life was uniformly distributed worldwide along the Equator, but the movements of continents and the rise and fall of sea level ensured that many more species survived in the Indo/Pacific basin. A false clown fish emerges from an anemone hiding place. Probably the most important event was the great ice age that covered North America and Europe with two-mile-thick glaciers as late as 18,000 years ago. As worldwide sea levels dropped some 425 feet, many species died out in the shallower Caribbean than in the deeper Indo/Pacific. The Atlantis Resort at Dumaguete is lush and first class. The dive boats are trimarans boarded from the beach. Artificial reefs like this engine block provide a habitat for animals like this yellowmargin moray. Still, muck diving can produce a prodigious amount of interesting life, as with this shrimp goby and its shrimp roommate just inside the entrance to their den. Or this ornate ghost pipefish. Anthiasfishes inside a wreck’s wheelhouse. Sweet lips – always in motion. Porcelin Crab on tree coral. Blue sea star (that’s its name!). I believe this nudibranch is called a funeral jorunna. These nudibranchs are in the sources, but without a name. Clearly they know each other very well. Based on the carapace and what I can see of the head and neck, I’m guessing this is a loggerhead sea turtle. And this a green sea turtle. These sea snakes are very poisonous – and fortunately, pretty docile. 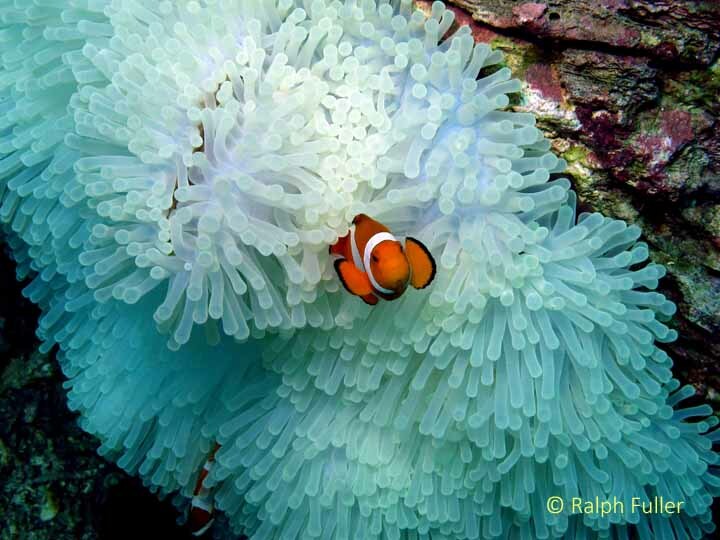 False clown anemonefishes in a magnificent sea anemone. Based on the cheek slash, I’m taking this as a pink anemonefish. We saw so many frogfishes…. …that photographing them got yo be routine. By dumb luck I got this one just as it was capturing lunch. Yeah, lionfishes. At least they belonged here. One of my Fish I.D. books shows 44 species of angelfishes, and these guys don’t appear to be among them. So I’ll just call them green angelfish. Obligatory sunset shot. Actually, we were facing east so it’s actually sunrise. But the idea is good. Principal Sources for Photo I.D.’s: Reef Fish Identification, Tropical Pacific, Gerald Allen, Roger Steene, Paul Humann, Ned DeLoach; Reef Creature Identification, Tropical Pacific, Paul Humann, Ned DeLoach; Indo-Pacific Coral Reef Field Guide, Gerald Allen, Roger Steene.